Recent discoveries made by researches from Texas A&M University at Galveston are providing a glimpse into how life formed in the Earth’s oceans, millions of years ago. 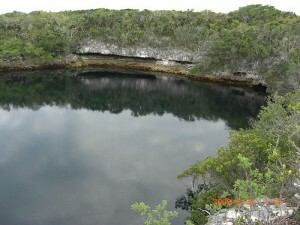 The researchers have been studying the bacterial microbes that live within blue holes in the Bahamas. With more than 1,000 water filled sinkholes, the Bahamas has the greatest concentration of “blue holes” in the world. In the three underwater caves studied so far, they’ve discovered amazing variations between the caves, each having evolved specialized forms of life at different depths. Acting as natural laboratories, the caves provide a place to study in conditions that would have been present on earth millions of years ago, giving a glimpse of how life evolved on this planet. The research, done in conjunction with folks from Penn State University, has been published in a recent issue of Hydrobiologia, The International Journal of Aquatic Sciences.